Otto Warmbier, American Taken Hostage by North Korea, Dies Days After Return to U.S.
Otto Warmbier, an American student detained in North Korea for committing “hostile acts” has died, his parents confirmed Tuesday in a statement. He was 22. Warmbier, who returned to America last Tuesday, having previously been sentenced to 15 years hard labor after stealing pro-government paraphernalia from his hotel, had lapsed into a coma before his return. The North Korean government claimed Warmbier had contracted botulism shortly after his conviction of crimes against the communist state in March 2016. Doctors treating Warmbier upon his return to Ohio stated, however, that they found no evidence of botulism, instead finding “extensive brain damage.” The North Korean government has not remarked on the discrepancy or provided any explanation for what could have caused Warmbier such brain damage in prison. “It is our sad duty to report that our son, Otto Warmbier, has completed his journey home,” his family wrote in a statement. 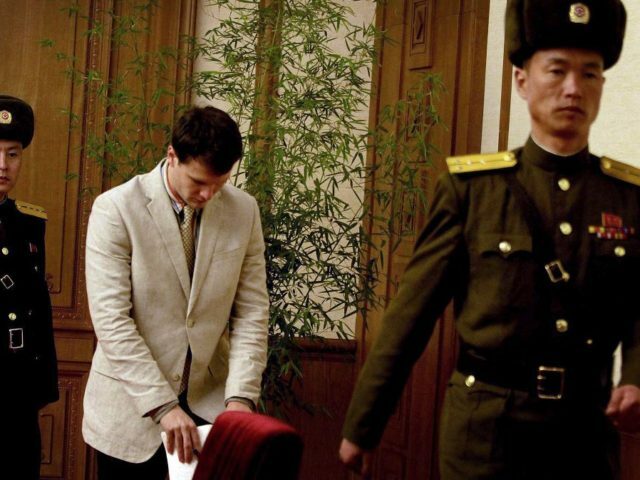 Warmbier was arrested during his visit for allegedly having attempted to steal a communist propaganda sign and forced to confess to the “serious crime” on North Korean television in February 2016. Warmbier pleaded guilty to taking down a political sign from a staff-only area of his hotel. “I have made the worst mistake of my life, but please act to save me,” he said at the time. North Korea continues to imprison three other U.S. citizens: academics Kim Hak-Song and Tony Kim, and businessman Kim Dong-Chul.